These components work in unison to provide complete towing system compatibility. The Reese differences are in construction materials, welding, manufacturing processes and hook-up. Adjustment is simple because of the easy-to-operate snap-up brackets that allow spring bar tension to be adjusted by changing links in the support chains. This lets you adjust for various trailer tongue weights within the spring bar weight range by applying tension on the spring bars until the car or tow vehicle is level. Rather than merely supporting the trailer tongue weight (TW), weight distributing hitches apply leverage between the towing vehicle and trailer causing the TW to be carried by all axles of the tow vehicle and trailer. When TW is distributed in this way, trailers with greater TWs can be towed resulting in a more level ride which reduces stress on the rear of the tow vehicle and provides greater steering and brake control. This must always be considered in trailer towing. Unwanted sway turns a pleasant towing situation sour. Many factors can contribute to trailer sway - the design of the trailer, the suspension, tire inflation pressures, configuration of the tow vehicle, towing speeds and hitch weight. Therefore, Draw Tite has devised several options to resist or temper trailer sway. There are two popular methods of sway control. The older more common form of sway control is a friction device referred to as Friction Sway Control. A more contemporary approach is a device controlled by cam action. Know as Dual Cam Sway Control, it is an innovative and effective technique to help control trailer sway before it starts. The Friction Sway Control does exactly what its name implies, it uses friction to resist pivotal movement and thereby works against the effects of induced sway. It operates on the principle of "stiffening" the coupling between the tow vehicle and trailer. The degree of "stiffening" or friction is adjusted to suit various trailer weights and towing conditions. Its operation is simple and uncomplicated. It doesn't prevent the generation of sway, it simply works to resist the forces once they have started. This patented product is the premier method for controlling trailer sway. Unlike the friction sway control, this approach works to control sway from the start rather than just resisting sway once it's begun. And it works only when needed. 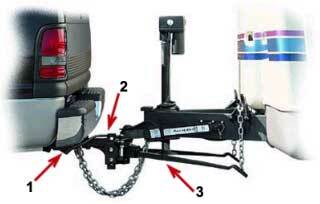 When towing in a straight line, the cams on either side of the trailer A-frame are locked in position. This essentially creates a "rigid" connection between tow vehicle and trailer and minimizes the effects of induced sway caused by high cross-winds or passing vehicles. Usually the cams ride in a detent, locked in position, even on fairly sharp curves. However, cornering maneuvers are required, the cams automatically slide out of their detent to permit full radius turns. Yet when the maneuver is short and abrupt, like that encountered in the event of a sudden swerve or a wheel dropping off the road, the cams seek a straight line towing angle that helps the tow vehicle retain control. The advantage of the dual cam system is its ability to forestall sway in addition to sway resistance. It works to hold down the start of swaying activity while at the same time allowing free and easy vehicle and trailer interaction. Another advantage of the dual cam system is that it's installed on the trailer and therefore doesn't require adjustment every time the towing vehicle and trailer are hooked up, unless hitch weight or tow vehicle loading are changed.